Even as Asian-owned businesses expand nationally, Hawaii saw a drop in the number of Asian companies. 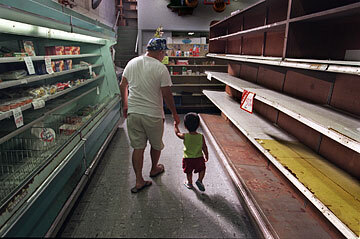 Wally Yokota took grandson Zachary Shigeoka down the aisles of the former Toyo's Superette in Manoa one last time before the store closed in 1998. Although the number of Asian-owned businesses grew 24 percent between 1997 and 2002 nationally, Hawaii experienced an 11.2 percent drop during the same time, according to data released yesterday by the U.S. Census Bureau. Nationwide, Asian-owned businesses grew approximately twice the national average for all business and generated more than $326 billion in revenues, up 8 percent from 1997, the last time the census measured this demographic. "The robust revenues of Asian-owned firms and the growth in the number of businesses provide yet another indicator that minority entrepreneurs are at the forefront as engines for growth in our economy," Census Bureau Director Louis Kincannon said in a press release. In the census survey, New Jersey edged Hawaii out of its spot as the fourth-ranked state in terms of the number of Asian firms. The top three states were California, New York, and Texas. Honolulu had the third-largest number of Asian-owned firms in 2002 of any city in the United States, behind New York City and Los Angeles. Asian-owned firms in Honolulu brought in $7.1 billion in receipts in 2002, according to the census. The survey defines Asian-owned businesses as firms in which persons of Asian ancestry own 51 percent or more of the stock or equity. The agency used data from more than 2.4 million businesses. While Asian immigrants always have played a significant role as entrepreneurs in Hawaii's economy, the numbers indicate that there may be a transition going on in the community, said State Economist Pearl Imada Iboshi. In 1997, 53.8 percent of all island firms were owned by Asians and Pacific Islanders, but by 2002 the percentage had declined to 45 percent, Imada Iboshi said. "The numbers show that there is a shifting away from Asian-owned firms in our total economy," Imada Iboshi said. "We see evidence of this in the marketplace, too." The list of Asian-owned businesses that have closed in Hawaii in recent times is imprinted on the memory of many kamaaina patrons, she said. Last year, the Sagara Store, located in rural Waialua across from Waialua High and Intermediate School, closed after serving customers for 83 years. The small family store lost traffic after Waialua Sugar Co. closed in 1996 and caused enrollment at the Waialua schools to decline. Toyo's Superette, a Manoa-based family business that was founded in 1918, also was forced to shut its doors in 1998 because of increased competition and higher rent. Arakawa's Store, which opened in Waipahu in 1909, is another establishment that chose to close in 1995 rather than try to navigate the changing marketplace. The advent of 9/11, which sent Hawaii's economy into a tailspin, wreaked havoc on larger Asian-owned businesses in the state. Chun Kim Chow Ltd., founded in 1908 by a Chinatown shoemaker, closed 21 stores, three shoe departments and its warehouse on Sand Island Access Road in 2002. But it's not just Oahu businesses that have been impacted by changing times. The Suda Store in Maui closed in 2003 after nearly 39 years in business. At the time of the closing, General Manager Roy Suda said the closure was due to economic downturn and competition. Many people don't shop at mom-and-pop stores anymore, preferring to make their purchases at supermarkets and big-box stores, he said. Though it's unclear why Hawaii bucked the national trend, economic analysts indicated that the growth of big-box retailers in the Aloha State could be edging out some of the small mom-and-pop operations. Many firms also have closed shop as the owners have aged and found that their children don't want to pursue the same career goals. The impact of 9/11 on Hawaii's economy, especially on service and tourism-based businesses, could have contributed to the downturn as well, said Imada Iboshi. "We didn't have much growth in our economy during that time period," she said. "It was a very difficult time for the state." Population trends, which do not show an increase in the share of Asians entering Hawaii's market, also could have played a role in the decrease of Asian-owned businesses, Imada Iboshi said. Higher costs, associated with the upturn in tourism and the hot real estate market, have made it more difficult for small-business entrepreneurs to compete, said state Sen. Will Espero (D, Ewa-Kapolei-Ewa Beach), who chairs the Senate Committee on Business and Economic Development. "With the rising costs, it takes plenty of perseverance and energy to succeed," Espero said, adding that the state has tried to bring relief to business owners. Senate Bill 2190, which just passed last session and offers a temporary unemployment insurance tax reprieve to businesses, is one of the measures the state is undertaking to reduce the cost of doing business, he said. Hawaii's tight labor market also might have encouraged Asian immigrants to try their hand at the variety of available jobs rather than engage in entrepreneurial pursuits, Espero said. "Immigrants are into entrepreneurship, but if there is a strong demand in the economy to fill jobs they might not have to go out on their own," he said.